"In your face" classic rock! Hailing from Baltimore, Maryland, these four multi-talented veteran musicians have enjoyed over twenty years of touring up and down the East coast together, thrilling audiences everywhere from Pennsylvania to Florida, and ultimately becoming one of the most popular classic rock bands in the Mid-Atlantic area. 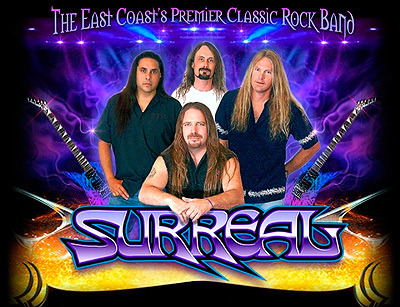 Surreal's exceptional musical talent, skilled precision, soaring four part vocal harmonies, dynamic personalities, awesome song list and professional sound, lighting and stage production is guaranteed to please a wide variety of classic rock fans everywhere they perform, with a highly entertaining and high energy live show that truly delivers, night after night.